After reading today’s title you are probably thinking ~ Isn’t everything we declutter material possessions ~ and you would be right. When I say material here though I mean fabric. So you guessed it this week’s missions are all going to be things made from fabric. Let’s see if I can come up with six things made from fabric that you might have to declutter. Monday – Declutter some old curtains that haven’t been hung in a while. I don’t have any curtains in my home because to me they are just dust collectors. I prefer blinds than curtains which I can just wipe down quickly with a duster. My vertical blinds must have some sort of dust repelling quality to them as they don’t collect dust at all. Gotta love that! Tuesday – Declutter craft fabrics that you haven’t had inspiration to use in a long time. Wednesday – Declutter a canvas wall art piece that you don’t love. Thursday – Declutter an item of clothing that you don’t feel good in. Be that because of fit, visual or comfort reasons. Friday – Declutter any sad old linen pieces. Old towels, sheets, pillow slips, hand towels, handkerchiefs, cloth diapers, wash clothes etc. Saturday – Declutter some old cleaning rags that have been used too many times already. Perhaps you could repurpose some of those linen items mentioned above into new rags. Personally I use microfibre and some of mine are getting very thread bare and therefore ineffective so will be tossed this week. I am surprised to be still finding kitchen utensils that I am prepared to declutter. We only need one pizza cutter, I don’t julienne vegetables and I only kept the middle size scone cutter because that is the only one I use. What a clever idea Sabrina. Making use out of something you love rather than having it linger is a cupboard somewhere is the act of converting something that has become clutter into something useful again. That certainly counts as decluttering especially since you are getting rid of the dark blinds. There is nothing like a new organisational system in your wardrobe to inspire you to declutter the clothing items you aren’t using. Because wouldn’t it be a shame to spend the money to install it and the closet still look cluttered and disorganised. Be ruthless! Meddling with my yarn stash, huh? 😉 Truthfully, I will go through it again this week, organize it and choose what will go out to the giveaway bag. I’m loving our microfiber cleaning rags too! I use them for everything. it is good to be hearing from you again. The commencement of the school year must have finally settled down for you. Liam is at the completion of his final year at university at the moment and I will be glad for him when that is over. He will be down your way them, spending a week in San Diego with friends before going to Seattle for four weeks. He is chomping at the bit as you can imagine. I must admit I did think of you when I wrote todays mini mission, even though I didn’t specifically mention yarn I thought you might substitute that as your mission. Have at it my friend. It is cleaning day today so my microfibre clothes will be getting a good workout. Especially the mop, my kitchen floor is a mess. Oh, Colleen, you’re cruel! I did three of these LAST WEEK – donated a framed needlepoint to the library auction, donated a crocheted afghan to the retirement home auction and cut up a large piece of fabric for tablecloths for the ‘tea room’ at the Senior Centre craft sale. I may have a taker for a large piece of pink sheer curtain material – hopefully destined to become a costume for a play. As all but the needlepoint were stored in the ‘black hole’ (i.e. basement), I’m making progress on that mission – with hubby’s assistance to boot! Ah Wendy, don’t you just hate it when you get ahead of me and then you have to find more of the same. I give you permission to declutter anything basement related rather than fabric this week if that makes it easier for you. The catch is you have to declutter two things down there everyday instead of one. Are you up for that? Even though I’ve parred down my sewing stuff to near bones…I still have random bits & pieces of fabric serving no purpose other than clutter. I knew a year ago I should have donated those fabric remnants but was holding on to them “just in case”. Never mind I have no idea what “just in case” would entail for fabric remnants…but they are going now. I’m heading up to the attic right now to drag them down along with a few more items for the donation store. We donate old towels to the animal shelters – time to look through those again as well! Hi Jane, when you are a crafter or in any way creative it is hard to let go of things that have the potential to be melded into something wondrous. I know because I am that kind of person. I have learned, through this declutter process, that one has to let go of that desire to a certain degree because just about everything out there has this potential. I keep eying of the stuff in my recycling bin. There must be something I can create out of all those coke cans my son goes through and those empty milk bottles. I have realised though that these things just keep coming so if one day I do come up with a great idea the supply is endless. Good challenge Seems like if you sew, fabric just accumulates. Our favorite thrift store sometimes has new material at great prices, and since the cloth stores prices are now about $7 a yard for the cheapest, it is really tempting. I once planned to quilt, but arthritis in my hands and a retired husband made me realize that wasn’t likely to happen. We don’t have a lot of cold weather most years, so there isn’t a need, I just love quilt patterns and things made from them. But every time I go through my stash, I do manage to find something to declutter, so this is a good challenge for this week. I had been thinking I needed to do another passthrough. Hi Nana, I don’t sew often but when I do these days I send any left over fabric to the thrift store as soon as I am done. I am tempted to keep it “just in case” but space mean more than “just in case” to me these days so I resist the temptation. I do however have a lot of paper crafting supplies at hand so perhaps next week this will be the focus of the mini missions. Hi Delores, unlike America, where scones are usually made into a round loaf shape with score marks so they can be pulled apart into triangles, in Australia and England we cut ours into individual round shapes pack them together on the tray and then cook. I actually don’t use the one I kept to cut scones much it is mostly used to cut circles of pastry to make mini caramel tarts. Colleen, Please, please share the recipe for the mini caramel tarts. They sound delicious! Thanks. They are delicious. Remind me later in the week if I haven’t already sent you the recipe. Colleen – I actually went thru my linen cupboard last week. Ironically it already looked organised and streamlined etc. I even have the sheets folded and sitting in mini laundry baskets with labels ‘king’, ‘queen’ and ‘double’ – but my won pointed out that we don’t have any queen size beds in the house, and when I thought about it I have never owned a queen size bed so I’m not sure why they were purchased. I said they could be used on a double size bed but all three kids were quite adamant that they won’t use the queen size fitted sheets as they pull off the mattress. So I freecycled them out. No ‘queen’ basket of sheets in my linen cupboard this week. Hi Moni, I love an organised streamlined linen closet. Actually I love all closets to be that way. Mine never used to be but with the limited amount of stuff I have now I would have to try hard to make it messy. I can’t say that I ever had a pair of sheets that I never had a bed for though. Although that isn’t altogether true. We did have a pair of king size sheets although we have never owned a king size bed. There was a reason though and that was because my husband had to work 500km away for eleven months. He had fully furnished accommodation there and the bed was king sized and he had no choice but to buy a set of sheets. Colleen – it remains a mystery to me why I had them and how something useless can hide out in the open. Just because they were neatly arranged I completely overlooked the fact that they were of no use to us. And I was surprised my son (of all people) picked up on the fact and the rest of us totally missed it. LOL. 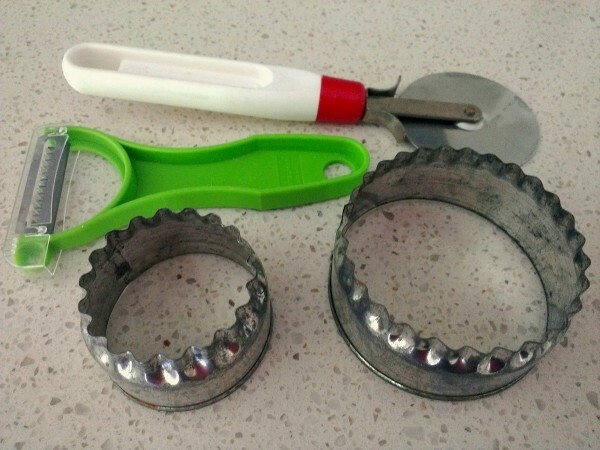 Your scones cutter reminded me to look at my sets. If I have a set of mixing bowls, cookie cutters, hair care tools, why keep the portion of the set I don’t use? Hi Gail, that is a smart move. Cindy wrote a post about this once. I might republish it this week and give her a day off. About the humane societies etc using sheets, pillows, towels etc, I have told my readers this many times after I was informed about it myself by a reader. It comes up often in the comments and it is in my Recycle Guide. I will put it in the Eco Tips for the day if you would like. Thank you for putting animal shelters on your eco post(12/5/12). I’ve seen you kindly suggest linens for animals before. New readers will appreciate a suggestion where to give their linens. The sweet furry ones are near and dear to my heart ( I volunteer at animal shelter). I guessed as much Gail. I was my pleasure to be of help. For Tuesday’s mini mission I have some yarn that I need to get rid of. I had good intentions of actually crocheting two different blankets and started both of them years ago. I never finished them, so now is a good time to let the dream go. Hi Jen, I gave up on curtains after moving house one too many times. The curtains for one house don’t necessarily suit or fit the next house each time and then more are required. I beat that game by not hanging any in this house and I haven’t missed them one bit. Actually now that I think about it we do actually have a set of curtains but they are in my son’s photography kit and not kept for the purpose to decorating. Looks like I’m going to have to substitute! Yay! These are just some of the areas I need to address. I took down some old curtains last week but I had not decluttered them yet…so they still count! I really appreciate these missions because whether I do them that day or not they niggle at my memory and I pay attention to those areas. The power of suggestion is much needed for decluttering! Thanks, Colleen for once again putting these missions together. My pleasure Grace. I usually just grab an idea out of the air sometime on Sunday for the mini mission. Sometimes the ideas are generated from what I have recently decluttered and sometimes my spur of the moment ideas set me off on my own decluttering mission. Oh buddy – I’ve hit the jackpot this week. Clothes of mine and DH to the thrift store, clothes of mine to a friend, clothes of the girls’ to the consignment shop, cloth diapers returned to a friend and to the consignment shop, baby carriers listed for sale, and we accidentally decluttered the house of every single piece of absorbent cloth when the washer overflowed and flooded the entire first floor. Now they are all at MIL’s house for a wash since we have no washer. Well done with the fabric decluttering Bergen too bad about the washing machine though. I hope it is only the water level regulator that is playing up and won’t take much to fix. This happened to me many many years ago and all it was was a little tube that had come unattached from this regulator. It cost more to get the repair man out to our house than it did for the five minute repair.